A few days ago I walked into my office and found a box of Thin Mints sitting on my desk. Right beside them sat two boxes of Peanut Butter Patties and a box of Caramel deLites. Immediately, a school kid excitement rushed over me. Had it really been a whole year since the last run of Girl Scout cookies. Moments after ripping into the Peanut Butter Patties I had an epiphany. There are no Girl Scouts in my office! The marketing arm behind these cookies is amazing. While the Boy Scouts are sitting around starting fires with sticks and tying their shoelaces into 712 different types of knots, the Girl Scouts are building a powerful business. In Anytown, USA you can walk down Main Street and see evidence of the foot soldiers the Girl Scouts employ to deliver their goods. Women in minivans double park to drop off cases of caloric heaven. In doing so they make the UPS guy look sloth-like. They are in and out of local businesses like hummingbirds. Now you see them, now you don’t. They convene in convoys at Wal-Mart to transport new shipments of Upside Downs. Which brings us to an all-important question. What the hell is an Upside Down? Girl Scout cookies have invaded all facets of life. This morning I stopped at a Texaco and they were selling Shortbread Trefoils for $4.95 plus tax. At least with an Upside Down, you can envision what it looks like. But a Shortbread Trefoil? I’m clueless. According to the official web site GirlScouts.org all of the girls pictured on the cookie boxes are actual Girl Scouts. Which is amazing considering these same girls were pictured on the first boxes in....1936. And since there have been no public sightings of a Girl Scout since computers were the size of trucks, we can deduce that this web site is, in fact, lying. During my brief investigation into this situation I have concluded that the Girl Scouts exist solely to sell cookies. This is their only, I repeat only, assigned task. Under the “Cookie Section” of the web site an inquisitive parent asks if all girls have to sell cookies. The web site response honestly announces, “Yes! If your daughter doesn’t sell cookies she will be tarred and feathered.” But, since we all know Girl Scouts do not really exist, we can assume that your child will not be tarred nor feathered for failing to sell cookies. However, all mothers are required to sell 4,000 boxes of cookies each year to avoid being run over by brainwashed cookie soldiers driving wood-grained minivans through Wal-Mart parking lots. Another disturbing fact about the Girl Scouts is that they are the reason behind the increasing number of overweight Americans. For example, each serving of Reduced Fat Lemon Pastry Cremes contains just over 3,000 calories. Furthermore, each serving is equal to 1/2 of a cookie. To simplify, this means that if you eat two Lemon Pastry Cremes your arteries will immediately clog and your heart may cease its traditional blood-pumping ways. And those are the “reduced fat” cookies. Although Girl Scouts do not really exist, they have managed to make themselves a very fine fortune in the cookie selling business. It is estimated that more than 2.5 million women in the world claim to be Girl Scouts. Strangely, every single one of those women is a professional baker. This revelation leads us to believe that these women are, like the web site, liars. We know this because A) There are NO real life Girl Scouts and B) the entire world’s cookies are baked by those little elves in the tree. If you find yourself bombarded by Girl Scouts cookies over the next few days, heed the following advice: Buy as many boxes as you can. If you do not, horrible things will happen to you. For example, the seller may have read this column and will be determined to prove to you that Girl Scouts really exist by telling you sappy campfire stories or running you over with a minivan. I have plenty of things left to say about this topic. However, the cookie crumbs keep causing my computer keys to stick. Thus, I must grab my box of Animal Treasures and vacate the premises. Pretty soon the convoy will be leaving Wal-Mart and I’m nearly out of Thin Mints. 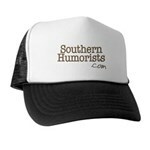 North Carolina Humorist, Wayne Hunt, currently works as an appraiser for a major U.S. automobile insurance carrier. In his spare time he likes to write...and is forever pursuing the lifetime dream of being a published writer. Visit his blog "Open Up and Say Ha!"